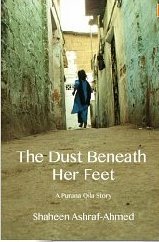 Curious Book Fans member koshkha loved Shaheen Ashraf-Ahmed’s two short stories The Dust Beneath her Feet and A Change in the Weather and wanted to know more. She spoke with the author of these stories and her latest novel, ‘A Deconstructed Heart’ to find out more about the author’s inspiration and influences. CBF: The Dust Beneath her Feet and A Change in the Weather are both part of the ‘Purana Qila’ series of short stories. I couldn’t see how the two stories were linked – did I miss something or will it take more stories for a pattern to become clearer? 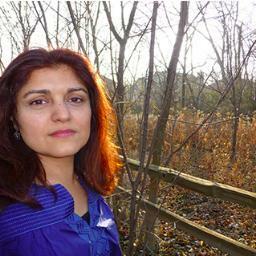 Shaheen Ashraf-Ahmed: I wanted each story to be complete in itself, but draw upon some of the same characters. The two stories are connected by physical location: they both revolve around Purana Qila, which means old fort. That is the name of the family compound where Imran lives with his parents, Alima Begum and Masood Sahib. The Dust Beneath her Feet takes place in 1946-7. Aarif finds work at Imran’s house as a servant. 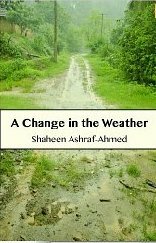 A Change in the Weather takes place in Britain of the 50’s (and modern India), when Imran is working as a doctor for a short while in England before returning to India following his father’s illness. I will continue the series by focusing on different characters who are connected to the Purana Qila home in some way and revisit some of the characters from A Change in the Weather and The Dust Beneath her Feet as their lives overlap. My ultimate goal is to pan out from the characters in these first stories living in or around Purana Qila in India, to examine their lives and the lives of their children and grandchildren as time and geography pull this small tight-knit community wide apart. CBF: Like many people I have mixed feelings about short stories (though of course I loved yours). What do you see as the pros and cons of writing this format? Shaheen Ashraf-Ahmed: The disadvantage of writing a short story is how disciplined you need to be to make the story work in a small ‘space’. It is hard work to keep the flow of the writing when you move from one time period (or point of view) to another in a limited number of words. I also need to remain aware, as I continue the series, that some readers are new to these characters and I cannot assume too much as I write the story, others know the background of the characters because they have read others in the series, and they will be looking for answers to questions I have provoked in previous stories. It is a delicate balancing act. I do love the similarity between poems and short stories: the discipline required (that I have just complained about!) forces a writer to weigh every word and idea carefully, to craft something tight and rich at the same time. I have always loved miniatures, whether it is in Mughal paintings or in the beautifully crafted furniture of Queen Anne’s dollhouse: the laser-focus and “world in a raindrop” vision needed to make something so small and beautiful has always appealed to me. CBF: One thing I liked about The Dust Beneath her Feet was the sense of ambiguity about who the ‘her’ referred to. Did you intend a heroine for the story or is this left intentionally unclear? Shaheen Ashraf-Ahmed: You are right in suggesting that the ‘her’ is ambiguous; there are lots of ways of interpreting who ‘she’ is. All the females in my story are strong, pragmatic and able to find their own peace in difficult circumstances and during some destabilizing times. ‘Dust’ is such an evocative word: in my story, it can be from the long road ahead of Safiyah as she contemplates her journey; it can encompass the idea of something dead or lost, to suggest all things Safiyah has lost, that she must leave behind. Muslim readers may be reminded of the religious saying that Paradise lies at the feet of your mother, which is meant to remind us to honor our mothers. It can be the literal dust, of dried reddish mud that stains Henna’s salwar hem as she learns to ride Imran’s bicycle, and the temporary freedom and independence that symbolizes as well as Henna’s strong spirit. And of course, the dust beneath her feet is the literal ground, the place ‘she’, whoever she is in my story, came from. It is the geographic locus of the story, since physical location is central to the plot and themes of The Purana Qila Stories. CBF: You’ve written elsewhere that the mother – Safiyah – in The Dust Beneath her Feet was based on one of your aunts. Can you please tell us what happened to your aunt when she went in search of her husband? Shaheen Ashraf-Ahmed: Sadly, it is both a mystery and a tragedy. My mother’s sister was much older than my mother, so what I know of her story was explained to her later. My aunt was married and had an infant daughter in the days before Partition. Her husband moved to what became the new country of Pakistan to find work and send money. As the border was closing, my aunt heard the rumor that he had remarried and she went to see him, leaving her baby behind with my mother’s family. She made the journey safely, but her family did not hear any news from her for a while. Eventually they got a letter from her husband to say that she had died. In those days, there was little knowledge about the cause of many deaths, so my family’s questions remained unanswered. What was clear, though, was that my aunt’s husband had remarried while my aunt was still alive. My mother’s family were not willing to send her daughter to live with her father and his new wife and they ended up raising her themselves. Many years later, my aunt’s husband came from Pakistan to see his child, but she, of course, did not know him and my mother’s family was understandably hostile to him. That was the only time father and daughter met. I have a photograph of my eldest aunt, and I keep it on a shelf in my house. For a long time, my mother has told me her story, and I hope The Dust Beneath Her Feet, while a work of fiction, honors her story. CBF: Was Imran inspired by one of your relatives, and how unusual would his relationship with his English lover have been at the time the story was set? Shaheen Ashraf-Ahmed: No, there is no relative with the exact same experience as Imran, but there were certainly relationships between students or workers from India and women in the West during those early days of emigration to the West. Some of those relationships resulted in marriages, and I have met couples who met this way; some of them resulted in broken hearts, and their stories are more likely to be whispered about. Often there seemed to be a difference in commitment level between the two parties; the Indian or Pakistani member of the couple was often deeply conflicted about contradictory responsibilities and expectations from their family in India, particularly in those days. CBF: Dislocation is a theme in both your short stories – the family torn apart, the man whose life is split between past and present and two continents. Which family stories have you drawn upon as inspiration for this theme? CBF: I’ve read the synopsis of ‘A Deconstructed Heart’ and the theme of a man under stress seeking sanctuary in a strange place (in this case a tent in the garden) reminded me of an article I saw in an Indian paper about a man who was so upset at the thought of paying his wife’s maternity bills that he went and hid up a tree to avoid facing his problems. What inspired your idea to have your protagonist respond in this way? Shaheen Ashraf-Ahmed: There are many authors that have used refuge in an unusual location in times of stress as a mechanism to allow characters in their stories to contemplate their life and their decisions anew. I’m thinking of two wonderful novels as an example: There But For The by Ali Smith and ‘Hullabaloo in the Guava Orchard’ by Kiran Desai (which may have been inspired by the story to which you refer). I felt it was important for Mirza, the main protagonist in ‘A Deconstructed Heart’, to physically move out of his home, so that he can think about what ‘home’ means when his wife no longer shares it with him. By being in the tent in his own garden, he is forced to see how much he has lost every day. The temporary or transient nature of his current dwelling is critical as he reflects on his life and is faced with the lack of (figuratively speaking) social structure around him. Much as I find the expression ‘midlife crisis literature’ reductive, I do think, speaking as someone of that age, that reaching your middle years brings you out of yourself and leads you to analyze your past decisions, hopefully leading you to greater wisdom. In ‘A Deconstructed Heart’, Mirza’s wife leaving him is the catalyst for that process, and it is further complicated by the fact that he does not have the strong family support system he could have relied upon if he had been still living in India. CBF: I’ve so far stopped myself from reading your novel ‘A Deconstructed Heart’ out of fear that once I’ve read it there will be nothing more to look forward to. What else do you have in the pipeline to reassure me that I can get on and read the book? Shaheen Ashraf-Ahmed: Oh, no, please don’t hold off on reading! I am currently working on the next story in The Purana Qila Stories series, which should be ready within the next month or so. My goal is to complete the whole series by the end of 2013, and then begin work on my next novel. I have not fleshed that out yet, but, as much as I love my short stories, I’m ready to lose myself in something more labyrinthine. One Comment on "Q&A with Shaheen Ashraf-Ahmed"